Ford Mustang Forum > Ford Mustang Model Specific Forums > Mustang S197 Forums (2005-2014 Mustangs) > 2011-2014 Mustang Talk > New Wheels and Tires Ordered!!! New Wheels and Tires Ordered!!! MHT Forged Edition 'Paragon' wheels, 20x10 rear and 20x9 front, wrapped with 295/30/20(r) and 255/35/20(f) Pirelli PZero tires. 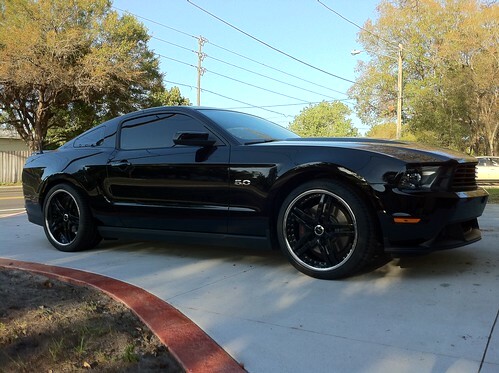 2011 GT Coupe (Black), Manual, 3.73 gears, Brembo pkg. with CS lower valance, Saleen grille, Bassani X-Pipe Cat-Back, C&L CAI, SCT Tuner (Brenspeed 93 Octane Street Tune 396 rwhp 382tq Dyno), Steeda Sport Springs, Koni "yellow" rear shocks, Steeda "heavy duty" upper strut mounts, MHT Forged Wheels. Koni "yellow" front struts...I hate back-orders! 2011 Mustang 5.0 412HP SG Charcoal Premium Comfort: Auto, Secure & NAV, Remote, HID, ButtCam & GTcs wheels, Sport Stripes, Roush AB's & plush 5.0 Mats! The process of ordering wheels through Mr. Wheel Deal is pretty straight forward...you find the perfect wheel for your needs and then fill out the form on his page. Within a few hours, I had an email from Steve with a few questions...after I responded, he contacted MHT and then came back to me with a quote...which was over $100 cheaper per wheel than the nearest online retailer. I had included what tires I wanted...his initial quote for the tires was more expensive than another online retailer. He asked for the website, which I provided, and a few hours later he came back able to meet the same online price with MUCH less shipping costs! He explained that he had to order from different vendors offering low stock discounts on the tires...so he is getting the tires from different vendors to fulfill my order. Here is the kicker...I believe that he is only charging what it costs him to ship the wheels. Where most sites charge at least $99/wheel, Steve is only charging ~$160 for the entire set of wheels and tires. Big Birt, mind telling us what color your car is in your signature? Great looking wheels, add some pics of your car before & after. The Silent Majority always get slaughtered! It's always the small minority radicals that impose their will on the majority who don't speak up! As you wish...it is as stated in the Sig block...for now...I have other plans...to which I can credit Chip Foose...I used to own a 1997 Autumn Orange GT 'vert...I loved that color...it too had a black top!! After reading this tread, I put a quote request for some Foose Classics 500 18x9 and 18x10. Right after the request I went on google to look for other retailers to look at prices and I nearly died. Averaging $1100-1500 per wheel. Let's see what kind of deal this guy can make! Waiting on my Boss 338s to arrive from Steve now. 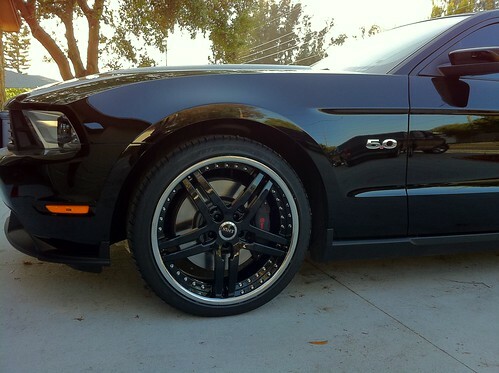 The New>> 2011 5.0 6spd,black on black premium ,3.73 option, Roush axelbacks,C&L cai,SCT SF3 w/93 race tune from Bama. Steve convinced MHT to fix the caliper clearance, since the wheel was the wrong size...the catch was that all four wheels had to be returned because to fix the caliper clearance, the spoke design had to be curved. MHT is NOT fast at building wheels...and I JUST received my wheels two days ago. They were definately worth the wait. I'll upload a few pictures and post here in a few. Would you mind sharing (or PMing me) the total cost of your order? I've been searching for a good place to buy wheels and if this is true, I may use Steve. I paid $4537 for the wheels and tires, shipped. Because I had to send them back for rebuild, it cost me another $200 (I assume for shipping both ways). Bringing my total cost to $4737. In comparison, the same wheels and tires from the cheapest online source I found was $5219. The real kick in the shorts was having to wait. I don't think this was Mr. Wheel Deal's (Steve's) fault though. The MHT wheels I purchased were a custom order. MHT claims 3-4 weeks for delivery, but it took nearly two months to receive the wheels....and when they didn't fit properly, I had to wait another two months. I was kind of disappointed by the weight of the wheel/tire combo. Because they are two piece forged, I thought they would be lighter than the factory 19" Brembo package wheels. I don't have a scale, but my impression is that the front 20x9 with the 255/35/20 Pirelli PZero carcas weigh the same as the stock brembo setup (Cast wheel with PZero 255/40/19). The 20x10 rear wheels with 295/30/20 PZeros definately weigh more than the stock rollers.